Did you know that 90% of SMS messages are opened in the first 3 minutes? SMS is an incredible way to reach your customers and prospects. However, how can you collect those phone numbers you want to promote to? In this article, we are going to cover actionable strategies to grow your SMS subscribers list. 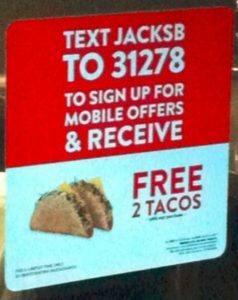 To get new SMS subscribers, it’s easy: you just need to incentivize people to share their phone numbers with you. How to do that? Offer them a reward, a coupon, or a special deal to join your list. Offer a free item, like a free drink with the purchase of a food item. Run a lottery: give new subscribers the chance to win a gift if they sign up, like a free TV or a cash prize. It is critical that customer understand that they will receive something when they give their mobile phone number. It’s pretty simple, but a lot of people forget to communicate that clearly! The ad starts with what the customer will get (“$20 off your next purchase”), which hooks the customer in. We want him to think “This is great, what should I do to get this discount”! 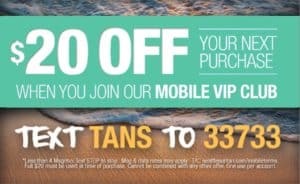 We then follow with the qualifier: to get the $20 off, you need to join the Mobile VIP Club. And finally, the call to action “Text TANS to 33733” explains what to do. A very important point: do not leave out the qualifier! If you remove it, customers might think that they are just signing up to receive that particular deal, and are not joining your list. They might then be surprised when you contact them with more offers in the future. To solve the issue, just don’t forget to include “join our mobile club” or something similar, and you’re good! Where can you put your SMS ads, and what results to expect? You can use different channels, and especially in-store, social media, or your website. The opt-in rates are usually in the 1% to 3% range when the focus of your ad is on getting SMS subscribers. Other channels include advertisement on TV or billboards which work well but require a higher budget,and emails (less helpful in developing countries). All this is well, but how can you get started quickly? No need to get fancy. Design a simple ad, print it and put it out there. It’s enough to get started. You can even use your own phone number to receive the subscriptions. However, we do recommend using a short code and proper database to be able to leverage your list efficiently in the future. This is something you can also automate using the techniques described in how to automatically send and receive SMS. Once it is designed and printed, you can they place your ad in your storefront if you have a shop, or in public places or even restaurants, bars or relevant partner shops. You’ll get immediate signups and purchases thanks to the incentive, with the added benefit that you’ll be able to market new offers to those customers later! Now it’s your turn, start implementing the above strategies and grow your own SMS subscribers list!